Venezuela leadership levies coup accusation at U.S.
CARACAS, Venezuela (VTV/CNN) – Venezuelan Minister of Communications Jorge Rodriguez claimed he presented “proof” of what he called a U.S.-backed coup attempt against the government of President Nicolas Maduro that would have taken place in January. 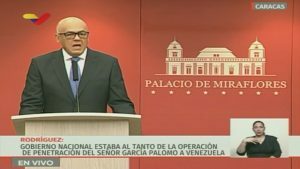 Speaking live on television from the Miraflores Presidential Palace in Caracas on Thursday, Rodriguez showed two alleged filmed confessions by military men who were implicated in the plot and were later arrested by security forces. CNN could not independently verify the authenticity of the videos. CNN was not able to verify any of these claims. The CIA did not immediately respond to CNN’S request for comment regarding the claims made by Rodriguez. The Maduro government has claimed to be the victim of coup attempts in the past.